I Got Totally Flared on the Fourth…No TT For Me! Do I have a story to tell on this fourth of July. So I wake up today super stoked to ride my first ever Nationals TT. We drive there a couple hours early and just chill with Kenny and Jeff (Kenny’s dad). Then with an hour before I’m supposed to role for the TT we go through a good hard warm up. After my warm-up I put all of my aereo equipment on and head over to the jig. I roll through the roll out portion of checking in and then the jig like its nothing. However, I was told to remove my water bottle since it was ‘too big”, whatever right? Then as I am standing there right when I am about to head up to the start one of the officials pulls the bike that I am leaning on right out from under me and drags it over back to the start of the jig. This guy tells me nothing as he does it, so I am like what the heck. Then he sits it to the side and just walks away saying at that point to me and another referee that the bike is illegal. After I shout at him a couple of times that my start time is coming up and he needs to clarify the situation he tells me that it has wingflex. What the heck is wingflex, right? Basically on most of the Specialized TT bikes they have these little nostril type flare’s on the frame just behind the fork and for some reason that makes it too aereo. Now lets think here for a second…my TT bike was a 2010 model Specialized, this means that its three years old, now you’re telling me that I have an unfair advantage because of a flare on the frame? Ridiculous, lets not forget that most of those kids had 2012 or 2013 TT bikes and lets face it, now I’m no aerodynamics specialist but I think that 2012 and 2013 aerodynamics are a lot better than a 2010. So from my standpoint me having a little flare on my bike doesn’t do one bit of difference. 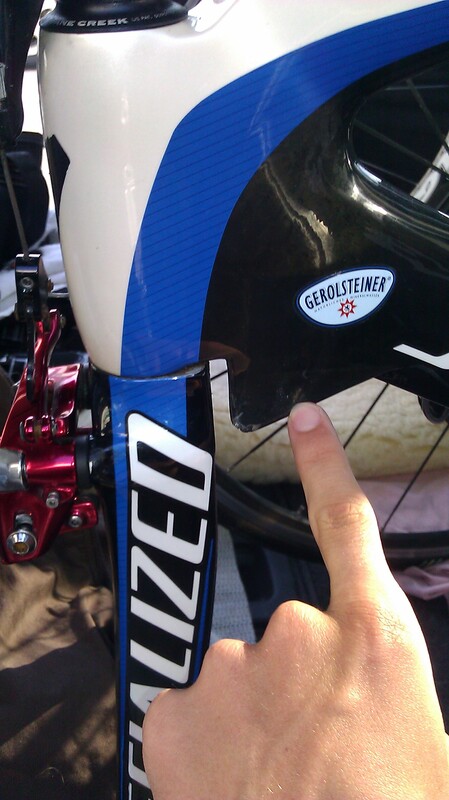 But thanks to the nice officials at USA cycling I wasn’t alone. There were sixteen other juniors who were DQ’d for this same problem. Pretty ridiculous if you ask me and even more ridiculous is a good portion of them who I personally knew were part of a select group of riders who I felt I was going to have to battle for the title, not the riders who won. They weren’t even on the radar screen. I’ll say it like this, sadly the riders who place well did it through a process of elimination that USA Cycling makes part of the experience, an experience I may not choose to do again. I don’t know about anyone else, but I would want to win through competition with the finest cyclist in the United States, not by having the best reduced/eliminated via a process that no one had any clarity on. Sad that this is how I can remember my first Nationals time trial, but the good news is that I have fresh legs for tomorrow.